> This is the industry standard Radiation Warning Sign, in the proper OSHA approved colors. 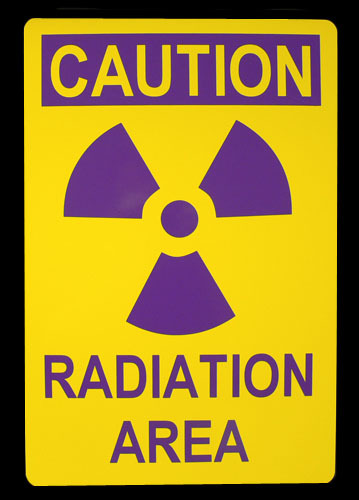 Ideal for identifying radiation areas both indoors and out. A great backdrop or posted near your collection of radioactive samples. Each individual component of the graphic is cut separately from its specific colored vinyl. The components are then layered by hand to form the completed graphic. The high-quality, all weather vinyl graphics carry a 7-year exposure rating. The sign is heavy gauge 6061-T6 Aluminum alloy. Measures 18" tall x 12" wide.